The plants that the Green Seattle Partnership(GSP) plants are very young, babies really, and we need to do everything we can to set them up to be able to grow and thrive. These helpful hints can be used for plants and trees in your yard as well as forest restoration sites. Two simple things: timing and mulch. Over the last 12 Green Seattle Days we have a lot of weather challenges: high winds, snow, and torrential rain. In fact, this year’s November 4th was the coldest November 4th since 1973! Why do we plant trees in the wet, cold fall months and not the sunny and warm summer months? Different than your yard, most of the GSP restoration sites don’t have irrigation. Therefore, we need to be thoughtful about when we plant. For the Pacific NW the ideal planting season is early October to mid-February when the plants will be regularly watered by the winter rains. Spending a few months acclimatizing in the rain will prepare the plant to be ready to grow when the spring sunshine ushers in the growing season. Another thing we can do to set up our plants for success is to provide them with some mulch. 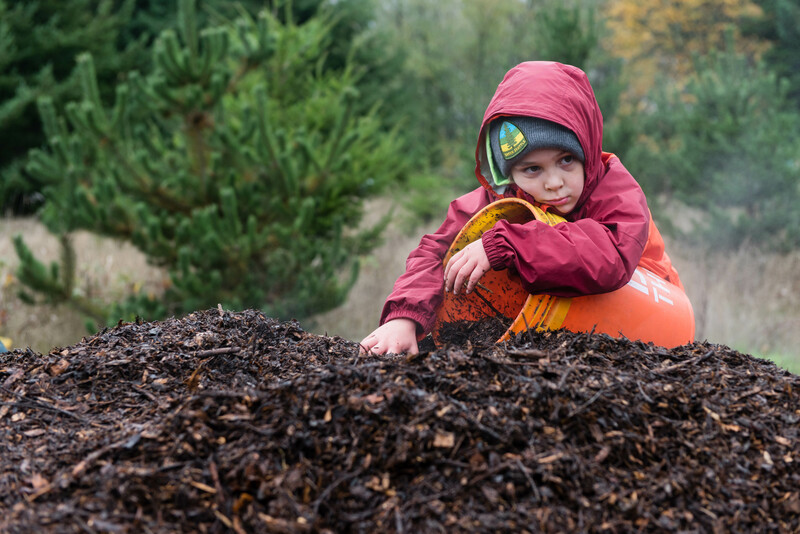 There are different types of mulch available to gardeners, but what we use is woodchip mulch, that are from removed/pruned trees within the Parks system. A mulch donut, a band of wood chips circling a tree about 4inch thick, is the prescription for new plants. Woodchips will provide the new plant with nutrients as they slowly break down, something that is important in many of our nutrient deprived urban soils. The mulch will also help retain moisture and help to slow down weed growth around the plant. Think of mulch as a nice warm hug and hearty meal for our young plants. Trees provide countless benefits for us throughout the year, so the least we can do is make sure we create an environment where they can thrive. Take some time to check in on your plants as both you and the plants brace for the cold winter months! Dig in further with this Proper Mulching Fact Sheet from the International Society of Aboriculture or article about ideal planting season from the Seattle Times.